Blog > Sitewide search engine! We’ve finally added a proper sitewide search engine to Soundslice! Public slices that people have posted to their channels. Users who are active on Soundslice (i.e., they’ve posted at least a single public slice). Here’s a sample search results page, for the query gypsy jazz. For slice results, you can press Play on any slice, right there, to hear what it sounds like and see the synced notation. If you’re interested in digging deeper, click to see the music in our full player. The “musicians” section is really nice for finding like-minded musicians whose channels you might want to follow. Near the top of the page, you can filter the results to just view slices, courses or musicians. Finally, note that this searches public slices. To search the slices you’ve created yourself, you still do that in the slice manager. Use the “Looking to search your own slices?” link in the sitewide search results to quickly access your slice manager’s search results for the same query. 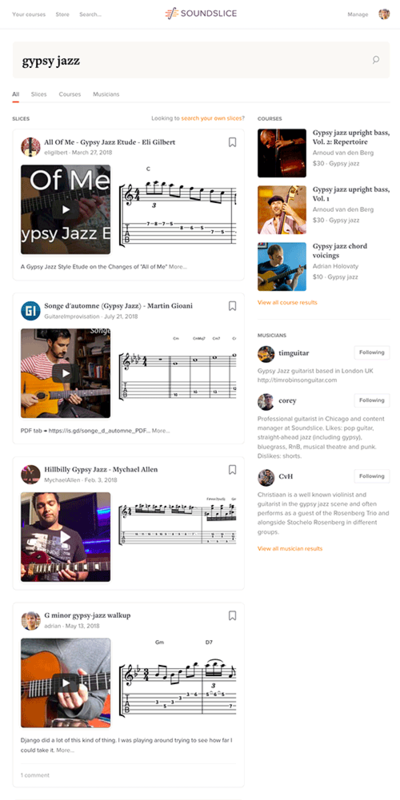 We hope this new search engine helps you find even more interesting music to learn and be inspired by.